I have had this idea floating round my head and I'm wondering if you can let me know your thoughts and tell me if it is feasible or not. I gave up growing because of landlord inspections, I used to have a 1m x 1m tent in my spare room with a 600w hps and got some good results, I tried to time it right every time but things either over ran or what happened when I made the decision to jack it in I had a huge leak through my living room ceiling and, after almost having a heart attack, had to quickly ditch my grow week 4.5 of flower. Wounded. So my plan is to build what looks like a wardrobe on the outside with a grow box on the inside. I will use MDF to build a box that is 70 x 70 and then build a box around it which is 85 x 85 and fill the cavity with insulation, either the stuff they use in recording studios, rockwool or sound proof plasterboard. I will also have 2 doors with the outer door having same insulation. 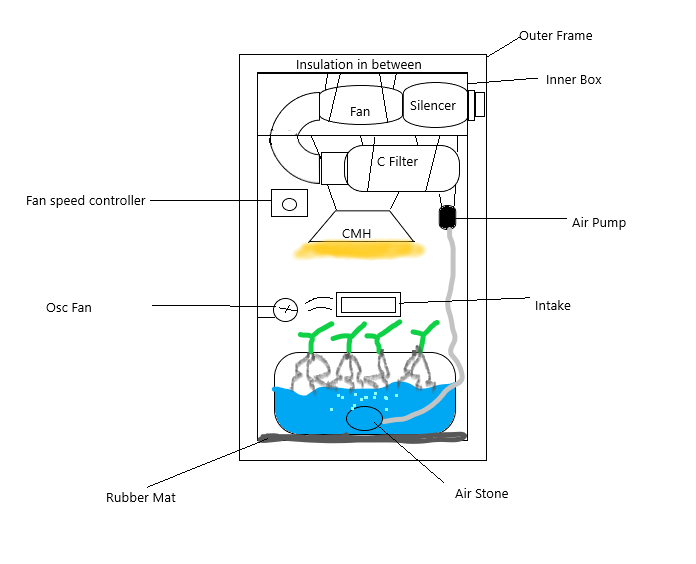 I will use a 315w CMH in an open air hood, 6 inch TD Silent fan, 8 inch carbon filter, fan silencer and acoustic ducting, a rubber mat under a tote which will be my dwc bucket and will have about 9 plants 12 12 from clone in a sog style set up. I'm hoping that by employing these techniques I can dampen the sound enough that if a landlord inspection happens, I can have a game running on my PC and have the fans mask any sound that leaks out. I don't know if all this will be in vein with a passive intake which is basically a hole that all the sound can leak out of, I only thought of the intake when I tried to draw my design. I am also unsure whether cooling will be sufficient. I have attached a crude drawing of my plan. My budget for the build is 1k and space is limited so I have a 90 x 90 x 200 area to play with. Can anyone throw out some ideas or let me know if you think this will work. Bump for advice! Shopping commences this weekend.